A new little arrival ... Monday! The thing with Monday mornings is that you never really know what to expect. A month ago I was having a productive and busy day when there came a buzz at the intercom by the gate in the garden. I couldn’t quite understand what the person was saying, so I pushed the button to open the gate and went down to the garden. I found a young Italian couple with a shoebox. 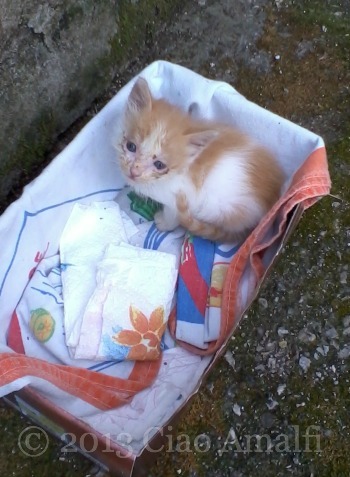 Inside the shoebox was the cutest and saddest looking kitten I’d ever seen. This nice couple were staying in their family vacation home for a few days, which overlooks our garden. They sometimes feed one of our cats who likes to go beg at their door when they come since they often grill out. Earlier that morning they had heard a tiny kitten meowing in a painful way near their house and rescued this little guy from where he had gotten his head stuck behind a pipe. There were terrible rain storms the day before, so perhaps that is how he got separated from his mamma and stuck in such a bad place. Unfortunately, that wasn’t the end of his bad luck. 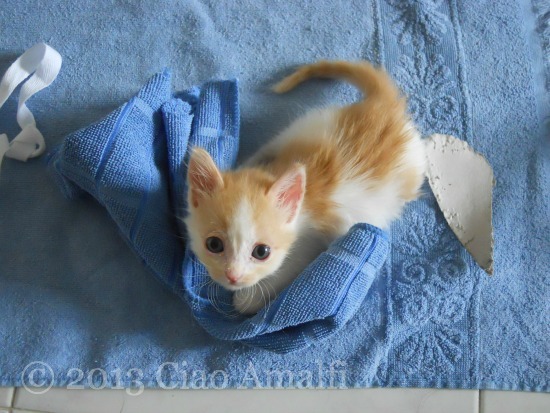 How the kitten looked when he arrived ... poverino! His eyes were sticking shut from an infection, but he was such a sweetheart right away. I snapped a few photos on my phone, including the one above, and sent them to a friend who knew someone who would take him. We were talking to one of the neighbors and standing right next to the shoebox while my husband put together the cat carrier to keep him safe overnight. Then all of the sudden a nasty male cat that had been tormenting our garden cats crept in and right in front of our eyes bit the kitten by the scruff of the neck and ran off out of the garden with it in his mouth! We were all shocked for a second or two and then ran off after them. We got him back right away, but not before the nasty male cat had done some major nerve damage. The kitten couldn’t walk! We packed him up and went to the vet a few villages down the coast. My eyes are open ... that's a start! He gave him some shots, gave me some medicine that I had to give to him with shots for 5 days, sprayed him with flea spray since he was covered with fleas and gave us the prescription for eye drops. We’ve since been back to the vet and he later told us he didn’t expect the kitten to make it. 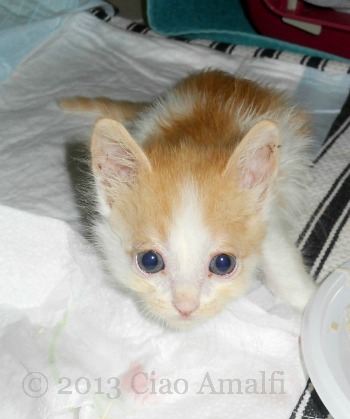 But the eye drops helped right away and soon he was looking at us with his bright blue eyes. I can almost sit up! He slept much of the first week with the medicine, but very slowly he got some movement back in his rear legs. One day I saw his tail twitch and a few days later it was flipping back and forth. He got movement back in one of his front legs, but it took a few more days to get enough strength to move very much. 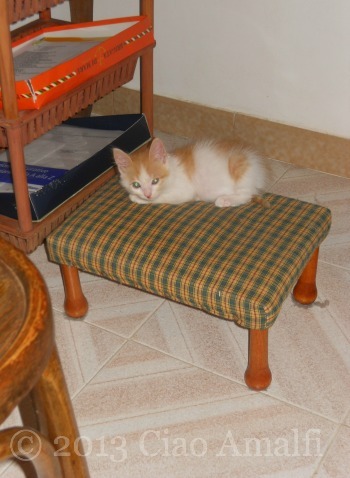 After nearly two weeks he had recovered to the point that he was starting to be a normal little kitten again. He loved playing in the sunshine the first day he could get around a little! He’s been such a good little patient! He’s had to learn to get around on the tile floors with only three good legs, because the movement has not fully returned to his other front leg. He can lift the leg up and try to reach, but the paw doesn’t respond. He walks on that leg with the paw tucked under. The vet has said that there’s not a lot we can do since there may have been too much nerve damage. 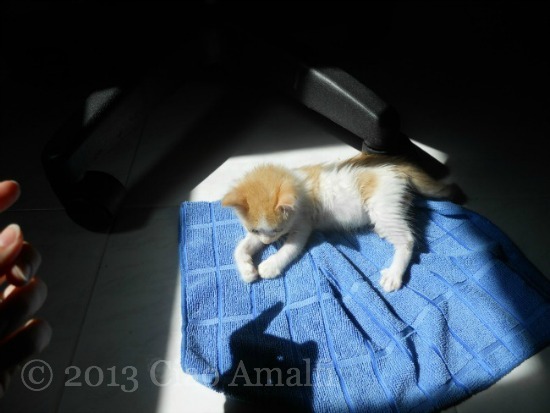 But now that he’s recovered and getting bigger, having a little paw that doesn’t work hasn’t slowed him down! He zooms around the house, tears apart anything cardboard, chews on everything that moves (or looks like it might move) and is absolutely a sweetheart. 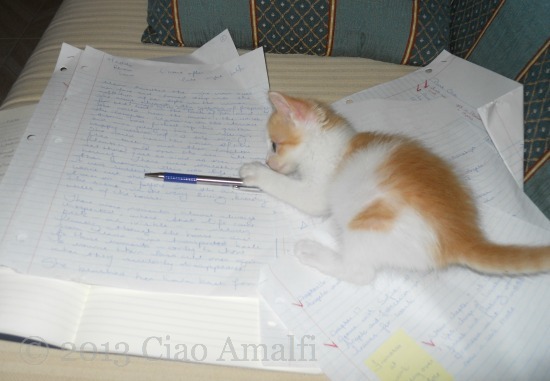 He has even taken to trying to help me write. Trying … that is. He’s in love with our outdoor cats that come inside during the day. They’re a little less enamored, but they tolerate him pretty well. 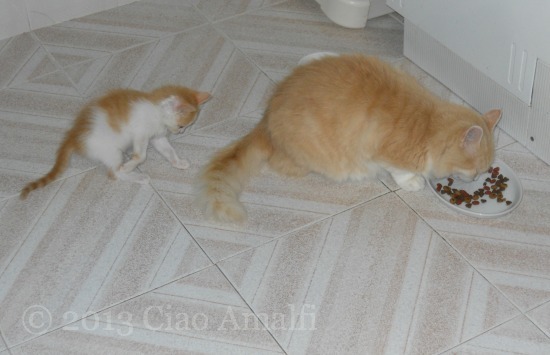 He comes running when they eat because he knows their tails goes swish swish swish … and that’s just too much fun. That swishy tail ... just ... can't ... resist! 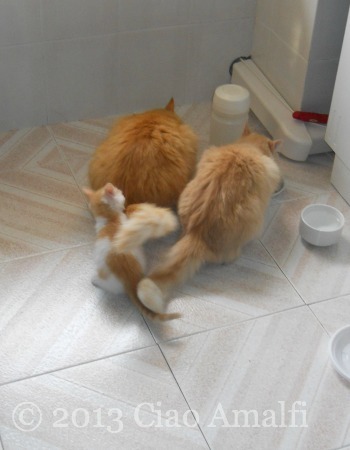 Of course, when both Puffy and Patu are eating at the same time it’s almost too much fun to stand. I think they’re just relieved that he doesn’t want their food … just to bat at their tails! He’s been exploring the house over the last week now that he can get around really well. One of his favorite spots is to sit on the small footstool below my husband’s desk and watch him while he works. He just likes to be close to him. When the kitten sits under my desk he just bites my feet, so my husband definitely has the better deal. So, you never really know about Monday. 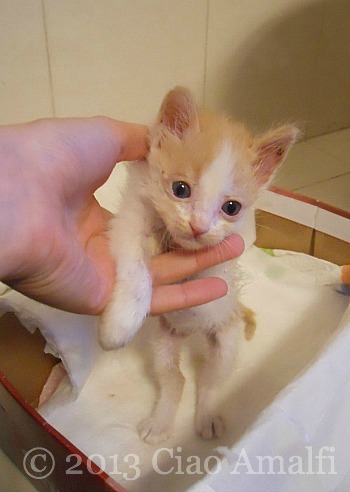 This little one nearly died twice and was lucky enough to be saved twice. He’s also found a new home where he can be safe inside and live a happy life, even if he can’t ever move that other front paw. Every time I sit down on the floor he comes running and takes a flying leap into my lap. Yep, he’s definitely found himself a new home. The sunrise this morning, the first day of September, was warm and soft. The start of a new month on the calendar can mean so little and so much. One day to the next, no big deal, right? But there’s something special for me about the beginning of September. While mindfulness and enjoying the present moment are important parts of my daily life, there’s still a part of me that counts down the days of August. Finally, it’s over. 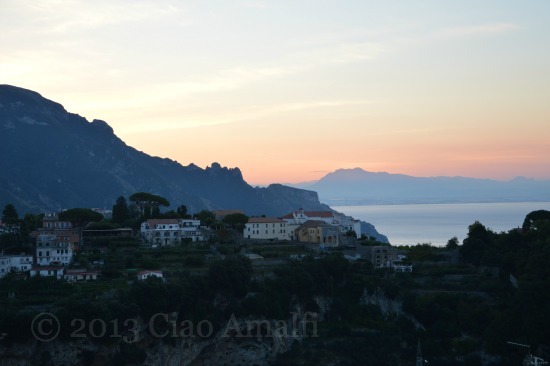 And it’s not just the heat and chaos of August on the Amalfi Coast that makes me eager to flip the calendar over and see September 1st. I was one of those kids who couldn’t wait for school to start at the end of August. Getting new school supplies (pencils and notebooks … oh my! ), the cooler temps and digging my nose into the new textbooks to inhale that distinctive textbooky smell were things I looked forward to. Yes, I actually sat around and thought about the smell of new books. Even now when autumn arrives with a chilly breeze and crunchy leaves underfoot there’s a part of me that longs to be walking across a college campus, the air full of anticipation and new things to learn. While those days are over, for me there’s still a feeling of endless possibilities in the autumn. This summer has been extremely busy and very far from relaxing. Yet another reason I’m relieved that it is over, while at the same time appreciating the many things I’ve learned along the way. 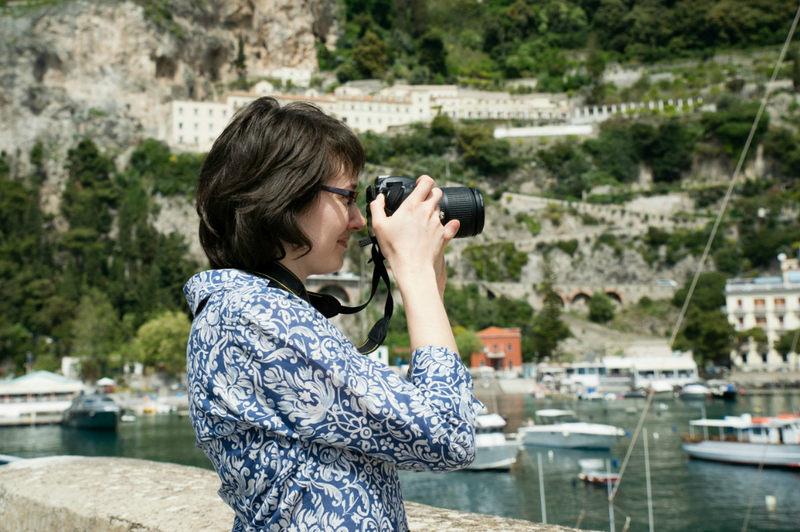 I’m eager to dive into new projects–both writing and in other directions that I’ll share here soon–and to enjoy another beautiful autumn season on the Amalfi Coast.